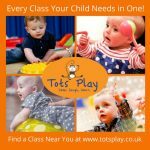 Tots Play offers a complete programme of classes, parties, information products and resources to give you the confidence and inspiration needed to play, connect and enjoy special time with your baby or toddler in ways which will enhance their development. The programme is suitable for children from birth to around 3 years, with a range of sessions aimed at different age groups, all designed with a unique mix of yoga, massage, signing, music and sensory play to aid development with fun! Please email michelle@totsplay.co.uk for more info or to book.